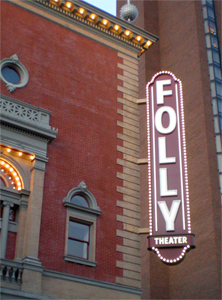 "The installation of the fabulous new marquee sign was the capstone to a successful 2012 for the Folly Theater, and Star Signs played an integral role in that success. We have genuinely enjoyed our experience working with your firm. Your ability to work towards solutions that benefit the client, and to keep your sense of humor while often dealing with cumbersome permit issues, have earned you the trust and respect of the Folly leadership. As President of the Folly Theater Board of Directors, it has been a pleasure to work with you, Denny Heilig, and your Star Signs team. At Kissick Construction, we value vendors that have the ability and resources to serve the client well. As we both know, ours in an ever-changing industry, which requires flexibility and an unwavering commitment to success. You and your firm represent these qualities, and our company is proud to recommend Star Signs for future projects." "Located in the heart of our Edwardsville campus, the Builders of the University Plaza honors the work of employees who have contributed to the growth of the University. There are currently 2,009 names affixed to the wall – and every single plaque was mounted by the dedicated people at Star Signs. They not only made sure that the plaques blended flawlessly with the look of the campus, but they also completed their task on time with a keen attention to detail that is rarely seen in the construction business these days. Each spring, we will add new names to the wall as more employees reach their 15 years of service. I have no hesitation about calling on our new friends at Star Signs to continue working at SIUE."